Even though there were several discussions last year about Twitter expanding its character limit, it is only now that they rolled out this new feature, expanding the limit up to 280 characters for a selected number of users: celebrities, brands, and publishers. Twitter says that this is in a test stage at the moment, but the change seems inevitable. After the rumor spread, many voices said that Twitter is losing its authenticity. Until now, the 140 characters limit was what differentiated Twitter from other social media networks and it was a real challenge for the content creators to fit their message within the limited number of characters. But this was also the beauty of it: sticking to a short and straight-forward message to showcase a product or an idea. Let’s hope the hashtags will still be defining for Twitter after this move. With the 140 character limit on Twitter, users were forced to create a special language, using “u” instead of “you” or “r” instead of “are” and hashtags to express ideas. These are examples of a language that was common to personalities, brands and other types of users. 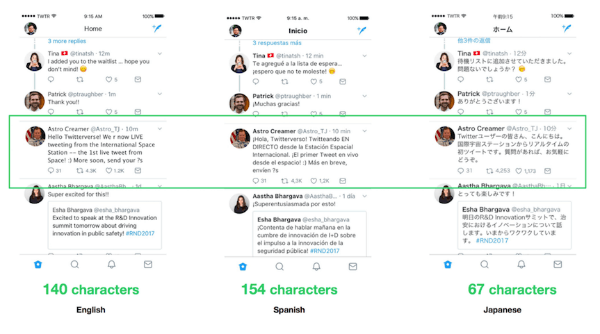 After testing on different communities from different parts of the world, Twitter representatives conducted surveys that showed that Asian communities are not as affected by the short number of characters, whereas others like English speaking communities, French, Spanish or Portuguese were more affected by the 140 characters. 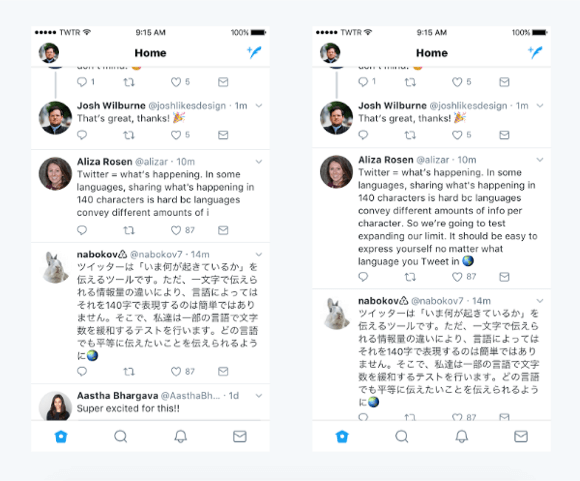 Twitter representatives say that this change is to affect other communities than the ones from Japan, China or Korea, as these languages make it possible to send 140 characters messages, unlike English, Portuguese, French or other languages. 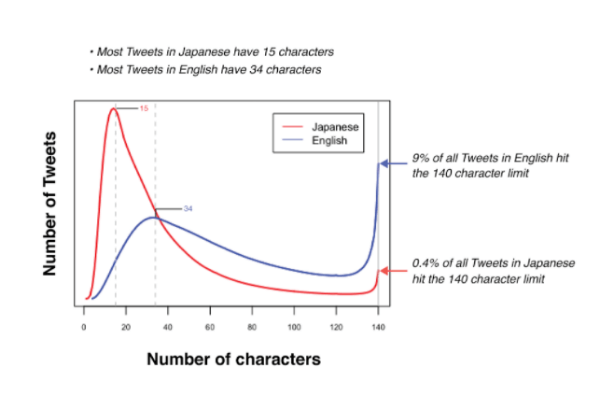 Some users felt frustrated when it came to composing the perfect 140 characters message and this is why, after studying behaviors, people at Twitter decided to enlarge the character limit. This is a simulation of the same message written in different languages, to see the difference in length. The first example is on a Tweet in English before and after the character limitation. Users that are emotionally attached to the old form of Twitter will have to adapt to the new format or they can as well still use 140 characters when it comes to sharing their thoughts, emotions or showcasing products – for brands. This update will be beneficial for the ones that even quit Twitter because of the short number of characters in which they had to write a message. Hopefully, from now on users will feel more comfortable with sharing content on the social media platform that made the hashtags stand out in the crowd. Let’s see when the update will roll out and worldwide and the impact it will have for both users and advertisers!